Naturally Plus operate in the nutrition MLM niche and are based out of Tokyo, Japan. In addition to Japan, Naturally Plus has offices in Taiwan, Hong Kong, Korea, Singapore, Malaysia, Indonesia, Thailand, the Philippines, Vietnam, Brunei and the US. Naturally Plus was founded in 1999 and is headed up by CEO and President, Takaaki Nagoshi. Nagoshi’s Naturally Plus corporate bio reveals nothing about himself and instead reads as an advertisement for the company. Naturally Plus in the US goes by the acronym “NPUSA” and is headed up by CEO and Director, Takashi Tajima (right). Possibly due to language-barriers, I was unable to research what MLM companies Tajima had been involved in prior to signing up with Naturally Plus. Read on for a full review of the Naturally Plus MLM opportunity. 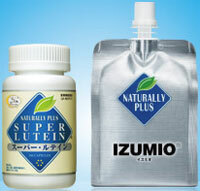 Naturally Plus has two flagship products in the nutritional niche, Izumio and Super Lutein. Izumio is sold in pouches and marketed as “natural water infused with hydrogen”. Naturally Plus claim Izumio is the “number one selling hydrogenized water in the Japanese market”. Izumio is sold in 200 ml pouches however the company fails to provide retail pricing on its website. Super Lutein is ‘a broad spectrum multi carotenoid nutritional supplement specially designed for eye and overall health‘. Super Lutein is sold in softgel capsule form (99 capsules in a bottle). Neither of Naturally Plus’ products appear to be available on a retail level. The Naturally Plus website does have a “buy now” link, however rather than provide consumers with pricing and availability of Naturally Plus’ products, it redirects to the Naturally Plus affiliate registration form. For the sake of simplicity, the following Naturally Plus compensation analysis is based on NPUSA compensation documentation. Naturally Plus’ compensation plan combines retail commissions with a residual binary back-end. Several offered performance bonuses are also based on sales volume generated and matched on both sides of the binary team. Some Naturally Plus compensation bonuses and commissions are based on Group Volume (GV). Group Volume is generated when Naturally Plus affiliates and retail customers purchase products. The Naturally Plus compensation plan states that 100 GV is generated per bottle of Super Lutein or box of Izumio purchased. A preferred customer is a retail customer that agrees to maintain a monthly autoship order in exchange for a discount. “Active” in the Naturally Plus compensation plan is defined as an affiliate or preferred customer who “purchase(s) products”. The example provided in the Naturally Plus compensation plan for product purchasing is monthly autoship. 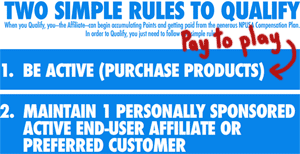 Naturally Plus affiliates are paid to sell products to retail customers (includes preferred customers). The Naturally Plus compensation plan provides an example of $20 on a typical retail order and $10 on a preferred customer order. Naturally Plus refer to residual commissions as the Day Cycle Bonus. The Day Cycle Bonus is paid out via a binary compensation structure. In the Day Cycle Bonus each side of the binary team is treated as an individual entity. Sales volume (GV) from recruited affiliate and retail customers on either side is tallied up daily. As above, each match threshold reached in a day adds an additional $50 to the Day Cycle Bonus total for that day. Note that if a Naturally Plus affiliate has only one active recruited affiliate or preferred customer, once they reach the 1300 GV threshold the count is reset and starts again until another 400 GV reached. If a Naturally Plus affiliate has and maintains two recruited active affiliates and/or preferred customers, once they reach 2500 threshold the count is reset and starts again until another 400 GV is reached. If a Naturally Plus affiliate has and maintains three or more recruited active affiliates and/or preferred customers, up to 5000 GV is payable in 300 GV increments. If 5000 GV is reached in a day the count resets itself and starts again until another 400 GV is reached. The maximum Daily Cycle Bonus a Naturally Plus affiliate can earn is $24,000 a month. Finally a 25% matching bonus ($100) is also paid out each time a personally recruited affiliate reaches the 2500 GV threshold. Naturally Plus affiliates are able to generate an infinite number of Day Cycle Bonus positions (referred to as “BaseCenters”). 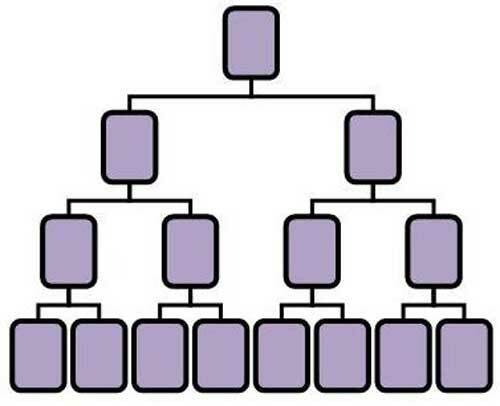 To keep things simple, think of these BaseCenters as additional binary positions placed with an affiliate’s existing binary team. number of points with (their) current BaseCenters‘. I believe this refers to $24,000 cap on the Daily Cycle Bonus earnings a single binary position can generate. Each month Naturally Plus take 1% of company-wide sales across the US and place it into the Frontier Bonus pool. Naturally Plus affiliates qualify for a share in the Frontier Bonus pool by having ten or more active recruited affiliates and/or preferred customers on the last day of the month. That is to say that for each group of active ten affiliates and/or preferred customers, a Naturally Plus affiliate earns one share in the pool. Note that shares in the Frontier Bonus pool are reset monthly based on the above criteria. Naturally Plus take 1% of bi-monthly company-wide sales volume across the US and place it into the Spirit Bonus pool. Naturally Plus affiliates can qualify for a share in the pool by meeting qualification criteria every two months. To qualify for a share in the Spirit Bonus pool, an affiliate must have five affiliates on either side of their binary team generate at least 2500 matched GV in the Day Cycle Bonus. At least one of the qualifying affiliates must be a personally recruited affiliate or referred preferred customer. Affiliates qualifying for the Spirit Bonus must also maintain at least two active personally recruited affiliates and/or preferred customers during the two-month qualification period. The final qualification criteria requires a Naturally Plus affiliate to generate at least 50% of the 2500 GV matched on both sides of the binary team is US sales volume. Naturally Plus take 1% of bi-monthly company-wide sales volume across the US and place it into the Upper Spirit Bonus pool. To qualify for a share in the Upper Spirit Bonus pool, a Naturally Plus affiliate must first qualify for the Spirit Bonus three consecutive times (three consecutive bi-monthly periods). Once qualified, the affiliate receives a share in the bi-monthly Upper Spirit Bonus pool when they continue to qualify for the Spirit Bonus. Naturally Plus take 1% of bi-monthly company-wide sales volume across the US and place it into the Grand Spirit Bonus pool. Affiliates qualify for a share in the Grand Spirit Bonus pool by qualifying for the Spirit Bonus six times over six consecutive bi-monthly periods. Once qualified, the affiliate receives a share in the Grand Spirit Bonus pool each bi-monthly period thereafter. The Star Bonus is 0.2% of Naturally Plus’ annual sales volume (Sep-Aug) and is paid out based on acquisition of “Star Points”. A Naturally Plus affiliate acquires Star Points based on downline affiliates on both sides of the binary team qualifying for the Spirit Bonus. From what I can make out the Star Bonus is calculated bi-monthly, with the total amount of generated Star Points used to calculate the eventual August payout (1 Star Point = 1 share). This qualification criteria must be met for each bi-monthly Star Bonus qualification period. Naturally Plus do not disclose affiliate membership on their website (NPUSA). I did however find membership fees on the company’s global website quoted in USD. Based on this information Naturally Plus affiliate membership can cost as much as $2330. Note that there are slightly cheaper options offered at each tier, however the product pictured doesn’t appear on the Naturally Plus NPUSA website so I’ve excluded them. Also note that the Naturally Plus compensation plan mentions an ongoing $30 annual affiliate membership fee. So uh… hydrogenated water hey? ZUMIO uses hydrogenized water to bond with the over saturated active oxygen species in our bodies to prevent the development of cells harmed by free radical. Combining the dissolved hydrogen within the water with the extra oxygen in our bodies can help form more water and keep hydration levels at a peak for longer sustained periods of time. This process is often referred to as “reduction” or the process in which oxygen is reduced or removed. Ingredients: filtered water and hydrogen gas . I’m well-aware that water itself is made up of hydrogen, so adding more to it seems a bit weird. Then again I’m neither a doctor or scientist, so I’ll defer to them. Quoting one such doctor who sells his own “hydrogen water”, a Time article from August, 2017, states ‘it’s not yet known exactly how added hydrogen in water potentially works on the body‘. What’s particularly interesting about this article is that it references Japan, one of the few places hydrogenated water seems to have taken off. Animal studies and the few human studies that have been conducted, mostly in Japan, suggest that it may work as an antioxidant and to reduce inflammation. Oxidative stress from the sun, normal body processes and exposure to pollutants can damage cells and lead to premature aging and diseases like cancer. Inflammation also contributes to many chronic conditions, from type 2 diabetes to heart problems and brain disorders. Hydrogen appears to reduce both. That means, at least in theory, that hydrogen water could help to reduce everything from diabetes to hardening of the heart vessels to Alzheimer’s and cancer. The studies to prove whether that’s the case, however, haven’t been conducted. Even without that confirmation, hydrogen water is the next big thing in wellness in Japan. The Ministry of Health recently approved hydrogen-infused saline IVs to help people recovering from infections and other conditions, and bathing in hydrogen water is becoming a popular spa treatment for fighting wrinkles and skin damage. Now while I’m not saying with any certainty hydrogenated water does or doesn’t deliver what’s claimed, I do think this is a clear case where marketing departments have jumped the shark. One possible reason Naturally Plus don’t disclose the cost of their products to potential retail customers on their website, is because they appear to be asking an awful lot for a product with no scientific backing. Perusal of Amazon reveals Izumio being flogged by “Pop Party Supplies” for $175 for a box of thirty 200 ml pouches. In a layman’s effort to be healthier, over the past few years I’ve upped my daily water intake to on average 1-3 liters a day. Needless to say in the midst of winter (1 L), I’d be looking at a monthly bill of around $875 (30 days). Curiously, the Amazon listing for Izumio states “no returns or refunds”. As for the carotenoid supplement, a quick Google search reveals they start at around $15 a bottle (30 capsules). Super Lutien is again available on Amazon, for the bargain price of $159 a bottle (100 capsules). Even when you factor in the capsule count different, that’s still pretty ridiculous. Needless to say I don’t see much of a retail market for Naturally Plus’ product offerings. And being an MLM company, that’s a problem. Naturally Plus’ compensation plan is retail friendly, even if the company’s website isn’t. Retail commissions are offered and preferred customers have the incentive of receiving free product if they refer new preferred customers to the business. Unfortunately that’s mostly undone by Naturally Plus requiring affiliates to purchase product and grouping preferred retail customers together with recruited affiliates. One of the first things shown to affiliates in Naturally Plus compensation documentation is a “6M Plan” and “12M Plan”. These are effectively six-month and twelve-month autoship plans. The exact amount spent each month isn’t provided, however from the Amazon prices quoted above we know it’s well over $100. To get the best deal available, register with the 12M Plan! To stay Active, join the Autoship program! To begin accumulating points and growing [sic] both Lines, share your story and encourage your team members to do the same! To summarize: Sign up with an autoship order and recruit other affiliates who do the same. If this was happening company-wide (affiliate purchase focus over retail sales), Naturally Plus would be operating as a pyramid scheme (ref: Vemma, Herbalife). Noticeably absent are specifics of monthly required volume. The Naturally Plus compensation plan equates being active with “purchase products”, but doesn’t actually state how much product needs to be purchased each month. In any event this is “pay to play” and is another regulatory compliance red-flag. The good news is ascertaining whether retail volume is being ignored within Naturally Plus as a potential affiliate is relatively straight-forward. A key qualifying factor throughout the Naturally Plus compensation plan are “Active PSPs” (specifically the Frontier and Spirit Bonuses). A “PSP” is a “personally sponsored person” and can be a recruited affiliate or preferred customer. Being “active” is “a state of having a valid period” (gobbledygook for “buys products each month”). What you want to find out is how many of your potential upline’s PSPs are recruited affiliates and how many of them are preferred customers (ask for proof via their backoffice). If your potential upline doesn’t have any PSPs, as a fall back you can ask them for monthly retail sales figures. If they don’t have any retail volume you’re probably going to be their first affiliate autoship recruit and you’re likely going to be required to do the same. This would pretty much reduce Naturally Plus’ compensation plan to recruit enough autoship affiliates to generate max binary volume, get a new position and repeat ad infinitum. Ultimately the legitimacy of Naturally Plus comes down to the retail viability of $30 a liter hydrogenated water and a seemingly overpriced carotenoid supplement. And for the reasons stated above, personally I’m just not seeing it.